We want people and businesses to do more with video. That was the straightforward premise behind the development of our latest release, Videxio Live. We understand the power of videoconferencing in helping companies to communicate more effectively, but we also know that sometimes it’s not possible to reach absolutely everyone you want to in one video meeting or conference event. At the same time, live video events have become an ever more mainstream feature for many organizations in the form of live streaming events, particularly via social media and platforms such as Facebook Live and YouTube Live. The power of video to engage audiences has long been known, but enhanced impact of live video is becoming indisputable; live videos on Facebook now generate audiences around three times larger on average than recorded videos. And video content as a whole, both live and precorded gets shared across social media more than any other type of content and more than text and image content combined. Many businesses are discovering that video, either live or recorded, is helping them to engage employees and audiences more effectively than ever before. While many organizations are starting to wake up to the possibilities of streaming and video content, arranging a live event can seem like a daunting prospect for many people. Live streaming event has gained popularity as an idea in large part because you don’t usually need much more than a smartphone and an internet connection to get started. But for companies looking to create something a little more profesional, the explosion of streaming and how to take advantage poses some challenges. For example how to easily connect multiple participants in or hosts in a live event when they're spread across different physical locations and probably using a vareity of devices and technology platforms into one video event? And how to ensure workflows are not too technical for the average user to manage successfully? Or how about data - a private individual may not always be too converned with how public their content and data are, but most enterprises who need to create video content want to be certain about the control they have over sharing, storing, and archiving their data. Videxio Live enables any virtual meeting room registered on our cloud service with live streaming and recording functionality. 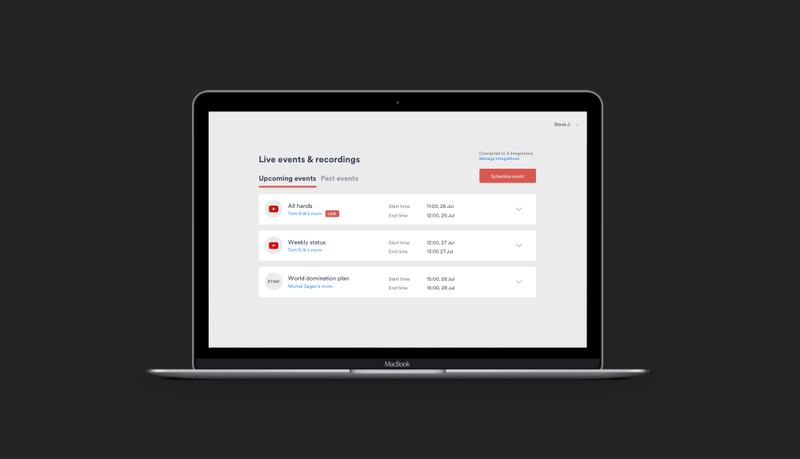 Users now have the ability to create self-service scheduled or ad hoc streaming / recording events in minutes, along with a huge range of options in how to publish and share content, allowing any business to utilize their videoconferencing resources for more than just video meetings. Whether it's for a company all-hands meeting, discussion panels, training seminars, or simply to bring someone up to date who couldn't attend the meeting, users will be able to stream and record amazing video events directly from a virtual meeting room to audiences of any size. The best news is that Videxio Live is free to activate for all customers with at least one user license for a virtual meeting room.You can learn more about Videxio Live by taking the product tour, where you can also request your 30-day free trial.